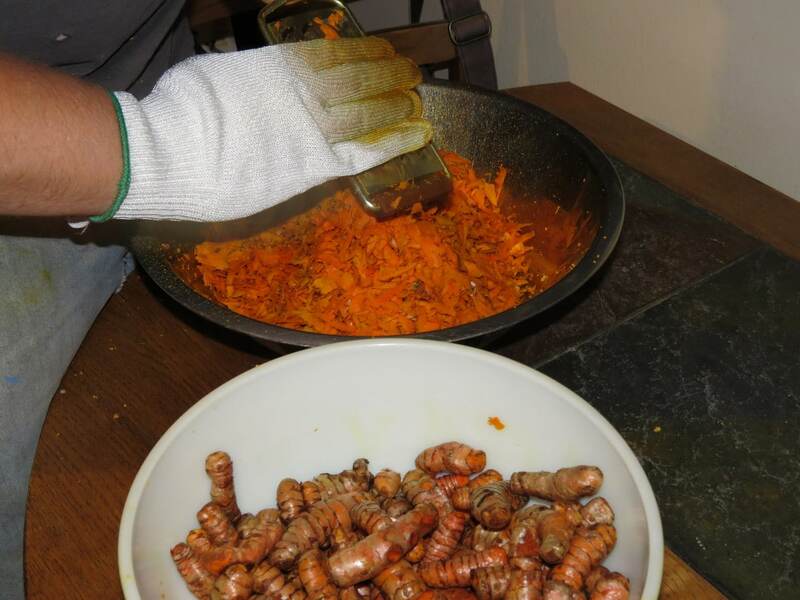 Turmeric is one of my favorite ingredients to work with. And not just because it looks so amusing in root form. It triggers the imagination in a fun way. Which is good when you need to deal with multiple pounds of it. Random flickers of amusement help greatly when faced with an Aegean task. It is also a fairly potent medicinal plant – for a wide variety of reasons, though not, perhaps, for as many reasons as the declarers of miracles on the internet would have you believe. However, it is also hard to find, organic or otherwise, and is one of the things that we have to process at home. There are two formats I have found organic turmeric in for sale. One is powder. A very fine powder, at that. Lovely for lozenges or shortcut-cooking, absolutely useless for tea. The other is dried in whole or near-whole root form. We tried cutting that down into tea sized bits, but it apparently becomes a sticky rock when dried whole. We had to get a special heavy duty set of pruning shears to even make the attempt, and the detached bits had a bad habit of flying off violently and attempting to remove eyes and flesh. Our initial dehydrator was helpful, but tiny, and we had to be cautious with how small we chopped things, as they would fall right through the slats when dry. Using organic white linen helped, but then we had to deal with the sticking-to-the-cloth problem. 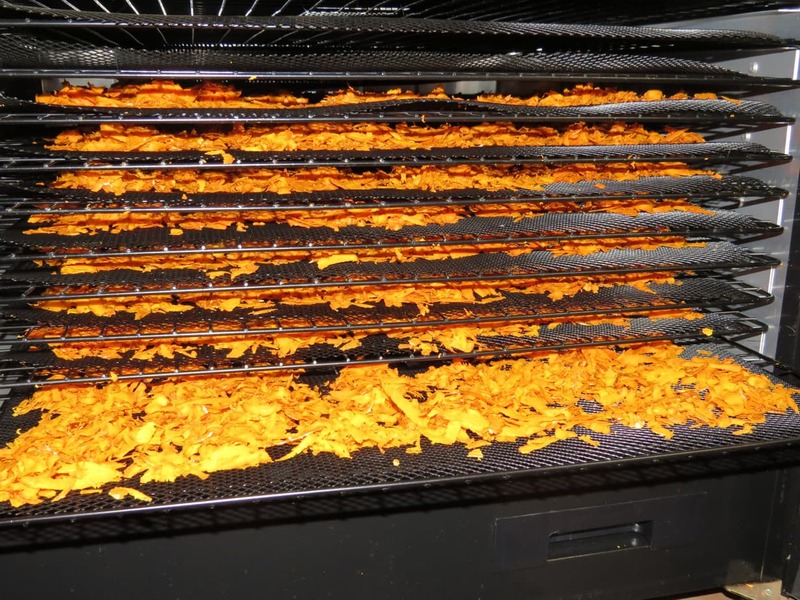 We were gifted an industrial dehydrator, and that streamlined the process beautifully. So, we begin with 4-5 lbs of turmeric. We then begin the process of grating it down. This takes hours. Not as many as chopping it down did, and it is slightly less brutal to wrists and arms…. … though the need to use as much of it as possible does require a special glove. Mister Tea would made a horrible tea ingredient. Believe it or not, it can be a wee bit dangerous to grate a root all the way down to nothing. After the grating is accomplished, we spread it out onto the drying trays. Eventually it finishes up, and we move on to packing it all up for on-hand use. 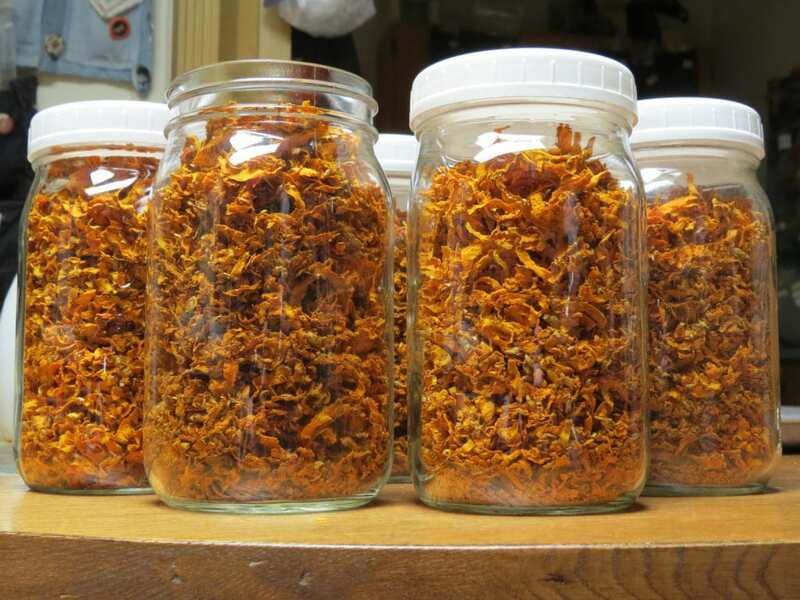 In the end, we have filled jars, which always seem like they should last longer than they do. Believe it or not, turmeric dries down quite thoroughly. From each pound we get 2.2 ounces. 2 and a half if we are quite lucky. 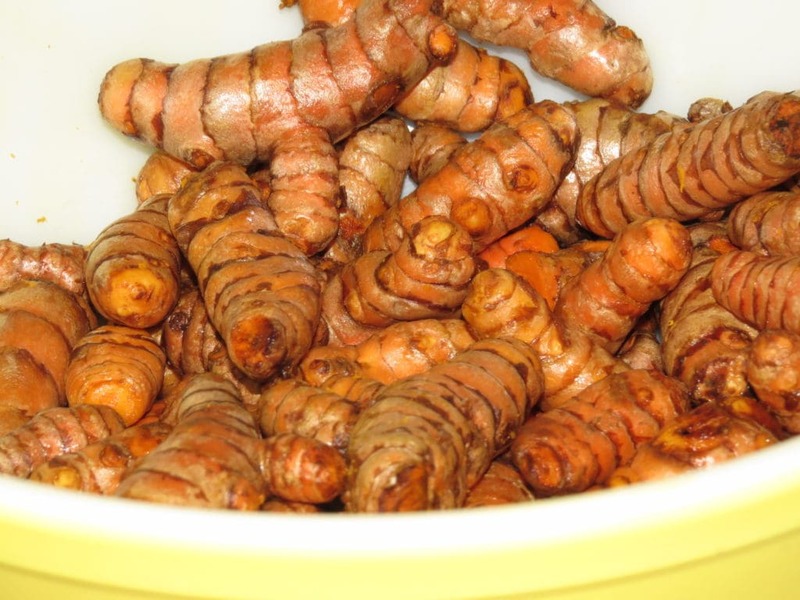 We have hopes that if we can expand enough, we will be able to order 25-50 lb lots directly from Hawaii – which will require days of work as it doesn’t freeze well, but it would cause an overall cost/price drop for our turmeric teas. 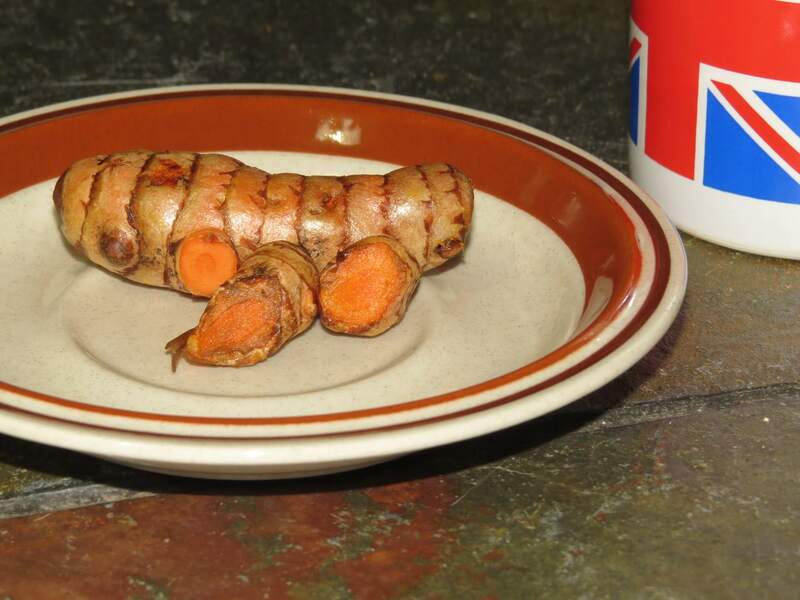 However, given our love of this glorious orange root, the day of work and cold food is well worth it. 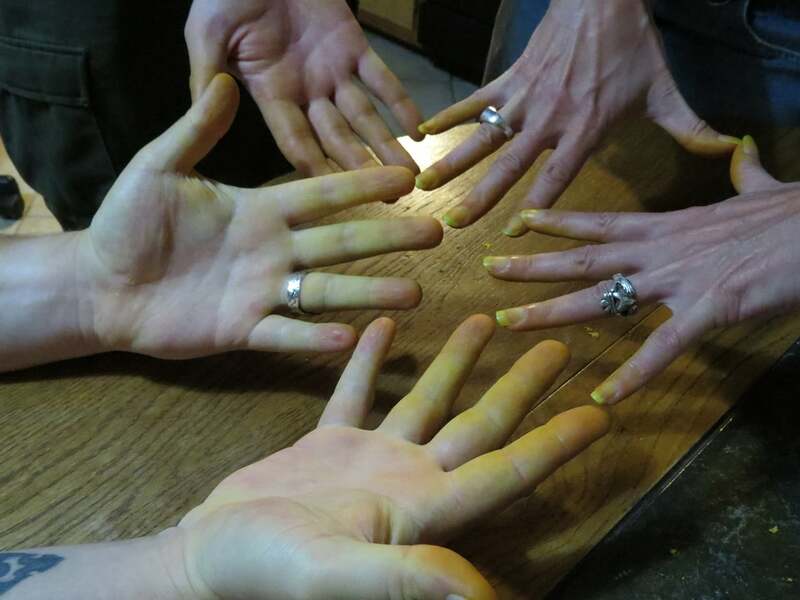 We even find amusement in the yellow-orange hands. 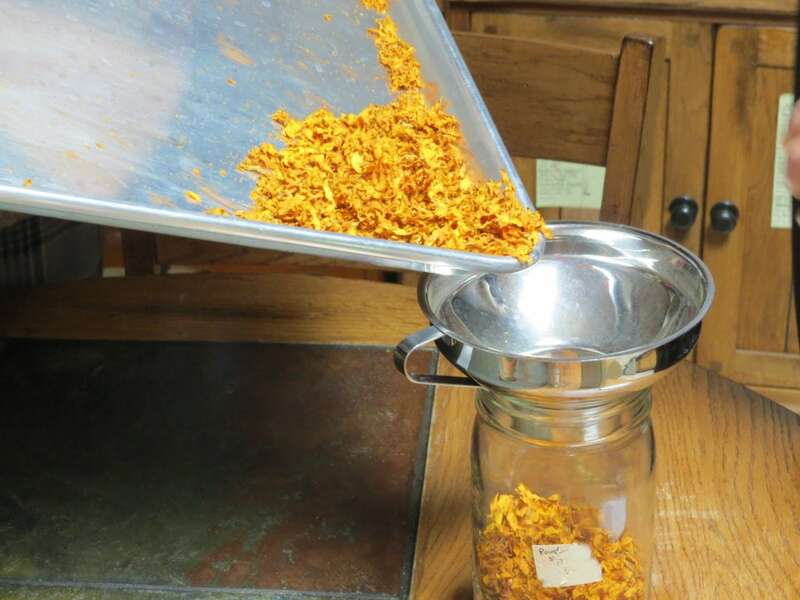 This entry was posted in Ramblings and tagged Intensive ingredients, Our Process, Tea Ingredients, Turmeric by DesertSage. Bookmark the permalink.